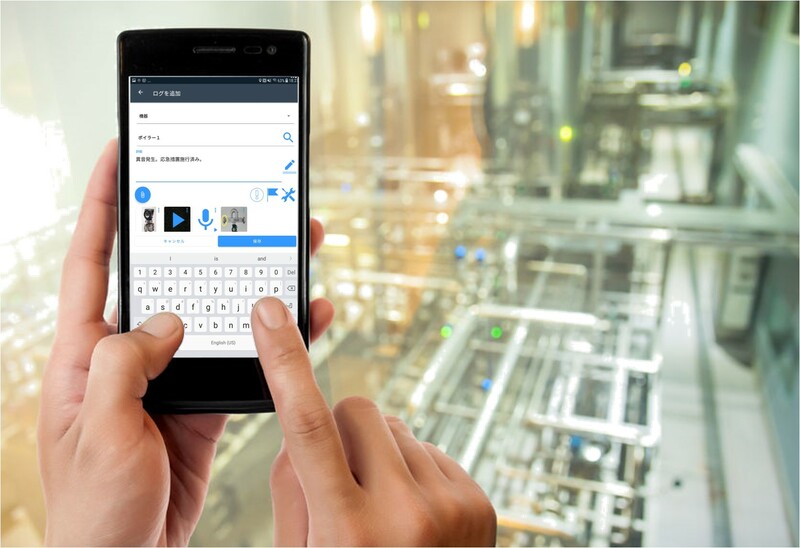 Yokogawa Electric Corporation (TOKYO: 6841) announces that the company has developed OpreX™ Operational Risk Management: Field Assistant R2.02, an Android™ application that is intended for use during field inspections of industrial facilities, and will release it in all markets other than Japan on June 11. A functionally enhanced Japanese language version is scheduled to be released later this year. With Field Assistant R2.02 installed on a generic Android tablet, personnel can enjoy access in the field to checklists, manuals, and many other kind of documents, thus increasing the quality and efficiency of the work performed during routine patrols of manufacturing sites. At many industrial plants, field inspections are performed periodically by staff who patrol along defined routes, checking field instruments and equipment at specific points along the way, in order to keep the facilities and equipment safe and in good working order. While the common practice has been for the results of these inspections to be manually recorded on a printed checklist that is then submitted for review, many of our customers have expressed the wish to be able to directly enter the check results onto a mobile device such as a tablet. Our customers have also indicated that it is a challenge to select and take with them on these patrols all the documents that they must be able to quickly reference, such as inspection histories and equipment manuals. With Field Assistant R2.02 installed on a generic tablet, personnel can enjoy ready access to all the checklists and related documents that are needed when performing equipment and instrument inspections in the field. In addition to being able to consult and fill out these documents as needed, they will have the ability to take pictures and record videos needed to report their inspection results. Field Assistant R2.02 can run on tablets that support Google's Android mobile operating system. Versions running under other operating systems are also planned to be released. 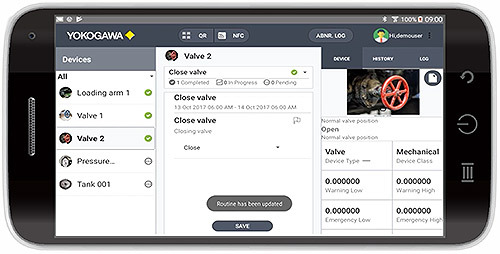 Via the Field Assistant R2.02 user interface, users can access both digital checklists and related documents such as operating manuals, specifications documents, and installation manuals. The use of digital checklists eliminates the cumbersome process of making handwritten entries and lessens the chance of data entry errors, and they are also easier to update. Pictures and videos can be taken easily, and inserted in a checklist. By attaching QR Code labels or near-field communications (NFC) tags to each piece of equipment and associating them with related documents in advance, users need only to scan the code label or tag with the tablet to view all the associated documents while performing a patrol. Auxiliary functions such as the issuance of alerts for abnormal readings are also provided. The checklists and related documents can also be downloaded from a server and saved on the tablet, so Field Assistant R2.02 can be easily used in places where there is no Internet access. Data accessed using Field Assistant R2.02 can be linked with the data that is recorded and managed using the OpreX Operational Risk Management: Operations Management software package. The Operations Management software assists plant operations and management personnel by facilitating the sharing of information on items such as unusual events, work progress, and operation workflows. By digitalizing and standardizing how this data is handled, this software helps plant personnel carry out their work correctly, safely, and efficiently, and thereby enhances corporate value. The data linkage between Field Assistant R2.02 and Operations Management allows manufacturing and maintenance personnel to better coordinate their activities. This improves the efficiency of operations management by managing the transfer of work instructions from operators to site staff. It also helps with producing handover reports and work reports containing pictures or videos taken on site. OpreX is the comprehensive brand for Yokogawa's industrial automation(IA) and control business. The OpreX name stands for excellence in the technology and solutions that Yokogawa cultivates through the co-creation of value with its customers, and encompasses the entire range of Yokogawa's IA products, services, and solutions. With this brand, Yokogawa will deliver integrated solutions that address specific needs and support its customers in their efforts to transform and grow their businesses.